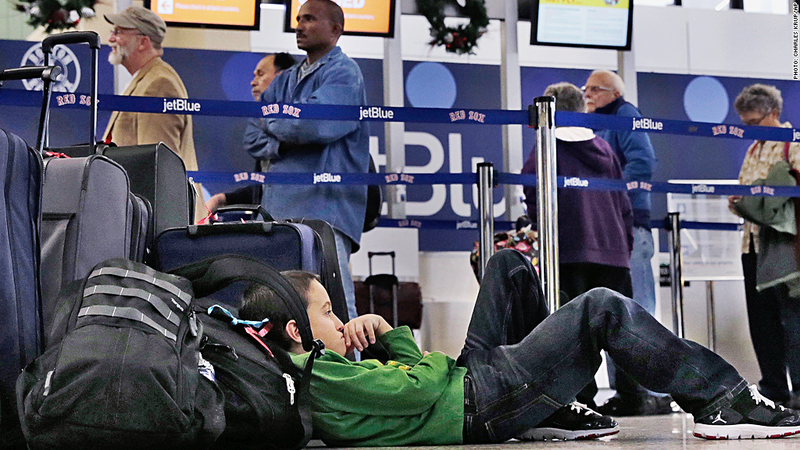 Seven-year-old Jordan Knowles rests his head against his family's luggage, who were rebooking their JetBlue flight back home to the Bahamas, at Logan Airport, Monday, Jan. 6, 2014, in Boston. Caught in the JetBlue vortex? The airline wants to make amends. After tens of thousands were inconvenienced by flight delays and cancellations amid the severe weather of the past few days, the company said Tuesday that it would offer compensation to affected customers. Per the airline's usual policy, travelers whose original flights were canceled were offered the choice of refunds or re-bookings free of charge. Non-members of the company's "TrueBlue" frequent flier program will also receive $50 credits for future trips, while TrueBlue members will receive 5,000 frequent flier points. Customers who faced multiple cancellations are eligible for larger credits, comped tickets and frequent flier points. The full details are available in a blog post on the JetBlue (JBLU) website. JetBlue chief operating officer Rob Maruster said on a conference call with reporters Tuesday that roughly 150,000 customers had been affected by cancellations in the past six days, though many were re-booked on other flights. He said the airline expected to have the situation resolved for all stranded travelers by Thursday. A spokeswoman later clarified that while also customers will be rebooked by Thursday, their travel dates could be later. "As of right now, we are running our normal schedule out of the Northeast," Maruster said. "What is abnormal is the amount of displaced customers, particularly those who have been displaced multiple times." Some customers were still struggling to finalize their travel plans late Tuesday. Two passengers stuck in Albuquerque told CNN that JetBlue was still looking for a crew to man their flight -- leaving their plans in flux. And JetBlue customer Shelly Budhan told CNN affiliate WCVB in Boston that the cancellations had left her facing the prospect of being stranded for days. "They were telling me I have to leave here on the 10th. I'm like, 'I have no family here, the money I came with on vacation -- I spent it all,'" Budhan said. "What am I supposed to do from the 6th to the 10th?" 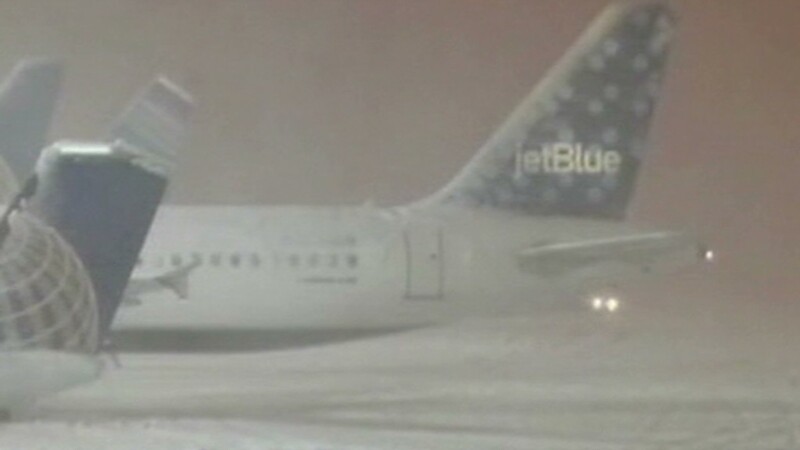 Maruster said JetBlue did not yet have an estimate for the cost of the debacle, which he blamed on the inclement weather and runway closures at New York's JFK airport. JetBlue's challenges were compounded by new Federal Aviation Administration rules that went into effect last week requiring more rest time for pilots between flights.